In 2008, Oudens Ello Architecture began a collaboration with Mystic Seaport on the design of an ambitious, all-weather waterfront museum building. 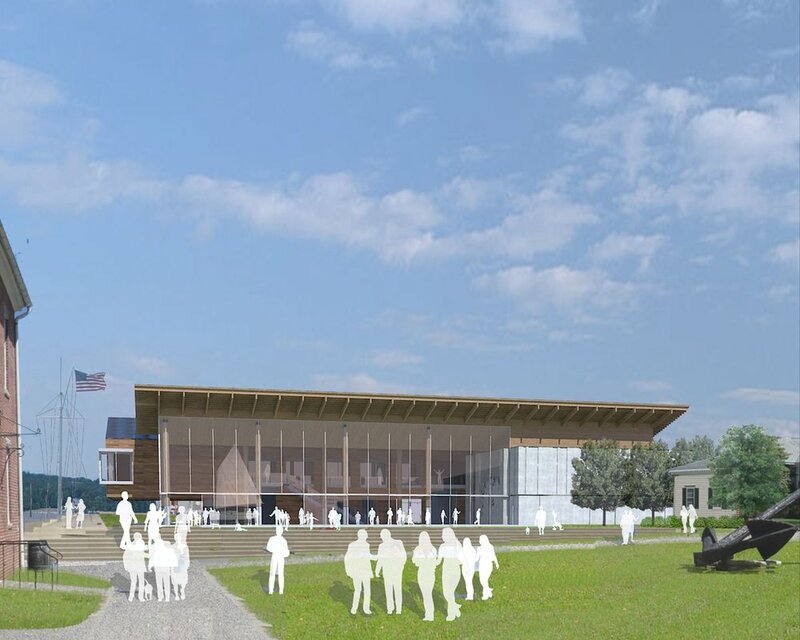 Schematic design for the two-story, 55,000 square foot museum facility was completed in 2009. The design exercise served to inform Mystic Seaport's current plans for a more modest transformation of the north end of campus. Acting as a gateway to Mystic Seaport for visitors arriving from I-95, the proposed facility was intended to become the visitor services hub and entry point at the north end of the Seaport campus. The museum building includes new temporary and permanent exhibition galleries, a 200-seat theater and a waterfront dining facility, all of which are organized around the Great Hall, a dramatic, light-filled central events and large objects exhibit space overlooking the Mystic River to the west and the Seaport Village to the south. The new exhibition spaces feature immersive, state-of-the-art exhibits designed by the UK exhibit design firm, Haley Sharpe Design. The facility also features a climate-controlled bridge between the new building and Rossie Mill, a repurposed 19th-century velvet mill currently housing Mystic Seaport's research and collection storage operations. The bridge element, in itself a literal gateway, fully spans Greenmanville Avenue (Route 27), offering safe passage of patrons and artifacts over the busy street. The proposed building recalls the scale and form of the wharf buildings and ships that occupied the site at the turn of the century. The wooden underbelly of the Great Hall’s inverted roof evokes a ship’s hull “on the ways”. The project features sustainable design initiatives such as geothermal wells, passive solar, natural ventilation, radiant heating and cooling, and an expansive photovoltaic array.